In the national ranking, the magazine gives Manchester high marks for helping students from low-income families achieve success and for making service an everyday habit. Service and service learning have always been core to a Manchester College education, a natural byproduct of a mission to graduate persons of ability and conviction who improve the human condition. "We believe that a college education should teach students about their responsibilities to the wider society," says President Jo Young Switzer. Washington Monthly looked particularly at how schools perform “as an engine of social mobility.” Manchester faculty and staff work closely with students to help them exceed even their own expectations. The College Success Center provides counseling, study tables, mentors and study aids, as well as career counseling, job search support, internships and connections. Most courses engage students in service – from leadership in mathematics competition among area middle schools to fitness guidance	for the elderly. The College’s Center for Service Opportunities coordinates scores of volunteerism, from food drives to charity walks to blood drives and green initiatives. The cornerstone project is the Indiana Reading Corps, one of the largest in the state. Each year, Manchester students from every academic discipline serve as reading tutors from almost 500 children in 23 area schools. Pleased principals note that the tutored children often jump two reading levels. Indiana Reading Corps tutors account for 2,800 of more than 20,000 volunteer hours tallied up annually at Manchester College. Students, faculty and staff work in soup kitchens and shelters, build houses, teach English to immigrants, help the elderly with income taxes, take medical supplies and care to remote areas of Nicaragua and raise funds for worthy causes. To learn more about volunteerism at Manchester College, visit www.manchester.edu. 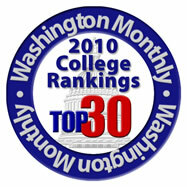 To learn more about the 2010 college guide of Washington Monthly, visit www.washingtonmonthly.com.